Do you have acne prone skin? Then you must be facing a lot of embarrassment when you go out. Sometimes it becomes hard to get rid them even after trying all sorts of medications and home treatments. You get a large number of products in the market claiming to cure acne. But they help in providing relief only for a short period. 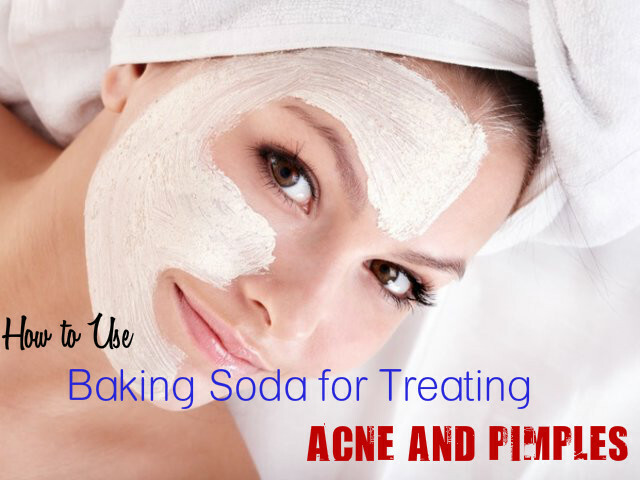 Have you tried baking soda to cure acne? It has the ability to dry out the pimples and remove excess oil present on your skin. Usually the excess oil is responsible for acne breakout and blackheads. Baking soda is cheap and it is also easy to use. So, o more running after expensive chemical based products and harming your skin with the chemicals in them. Baking soda can help you treat acne without harming your skin. When you have acne on your chest and back, you can cure it by taking baking soda bath. It helps in reducing blackheads and acne breakout on chest, back and other areas of the body prone to acne. Add 100 gm of baking soda to warm bath water and stir well with your hands. Soak in this water for 15 to 20 minutes and then wash your body with water. For deep cleansing your skin, you have to mix one teaspoon of baking soda with one teaspoon of water and two teaspoons of oat flour. Mix them well and apply it on your face. Massage your skin gently in circular motion and leave it for about 10 minutes. This works as a good exfoliator and removes all dead skin cells, dirt and grime from your skin, giving a deep cleansing effect to your skin. You can use baking soda face mask to remove excess oil from your skin. So, it is very effective for reducing acne and pimples by removing blackheads. This mask is mild and suits all types of skin. It may cause a stinging effect on your skin when you apply it on your face, but it is excellent for getting rid of acne. You can make the face mask by mixing 8 teaspoons of baking soda with half the amount of water. Mix them well to get a smooth paste that spreads easily on your skin. Clan your face with warm water and apply it on your face. Wait for 15 minutes, till the mask gets dry. Wash it off with water. Apply an oil-free moisturizer on your face immediately. This will prevent your face from appearing dry. You can apply it twice a week. You can make face wash with baking soda by combining 2 teaspoons of baking soda with 1 teaspoon of warm water. Mix them well to get a smooth paste. Splash some water on your face and apply this paste on your face in circular motions. Now wash your face with water. You can treat acne on hair line on forehead by adding 2 to 3 gm of baking soda to a bottle of shampoo. Shake the mixture well before you apply it on your hair. After shampooing your hair, rise well with water. Combine one tablespoon of baking soda with any facial cleanser that you use on your face. Make a smooth paste and apply it on your face. Massage well in gentle circular motion and then wash your face with water. This helps in exfoliating your skin and gives you a soft, clear and radiant skin. You can get clear skin that is free from acne by applying a mixture of baking soda and honey on your face. Mix both the ingredients to get a smooth paste. Apply this on the areas affected with acne. Wait for 15 minutes and then rinse with water. Baking soda can give an instant glow to your skin and make your face look bright. All you have to do is to mix baking soda with one tablespoon of lemon juice and a few drops of extra virgin olive oil. Apply this on your face and wash off after 10 minutes. Mix baking soda with water to get a paste that can spread easily on your skin. Rub this paste gently on your face in circular motions and wait for about 15 minutes. This helps in opening the pores of the skin and removes the dead skin cells and bacteria that have collected on the pores and the skin. Following this treatment once in a week helps you to get rid of acne effectively. Baking soda is very effective in getting rid of black spots and the scars that are left behind after the acne disappear. Mix one part of baking soda with three parts of water and apply this paste on your skin. Leave it overnight and the rinse off with lukewarm water. This helps in removing excess oil in the skin and the spots caused by acne. Baking soda is great for exfoliating your skin. Mix one teaspoon of baking soda with the facial cleanser that you use regularly. Mix them well and rub it on your face for about 5 minutes. Wash off with lukewarm water. This helps in exfoliating your skin and removes dead skin cells, thereby giving an instant glow to your skin. You can also combine 1 teaspoon of baking soda with 1 teaspoon of lemon juice and use it for exfoliating your skin. Word of Caution: Baking soda can cause a burning sensation on some of the skin types. So, before you use it for acne treatment, you have to test for any such allergies. To test it, you can apply a little of the baking soda mask on the nape of your neck or on your hands, and leave it for a few minutes. If you experience any burning sensation or allergic reaction, you have to wash it off immediately. You can use it frequently, but regular use is not good for sensitive skin.